HTC has announced its first standalone Vive virtual reality headset, one that works without being tethered to a PC or smartphone. It's still officially unnamed, though a press release refers to the device as the Vive Standalone. It is a consumer product that is exclusive to China, and is separate from the Google Daydream headset HTC is also developing, due to launch later this year. Whereas that headset will run the Google Daydream platform, the Vive Standalone taps into the Viveport content ecosystem. Based on the Qualcomm Snapdragon 835 VRDK reference design, this headset is a premium product in the same vein as HTC's Daydream device, and Qualcomm tells us the two headsets are near-identical, save for a few aesthetic differences. Neither headset requires connecting to a PC, smartphone or other device in order to run virtual reality experiences. HTC isn't announcing further details on this new headset right now, including what it's final name is, specs, release date or price. What we do know is that it will run the Snapdragon 835 chipset and have six-degrees-of-freedom tracking, but not much else. While this headset is part of the Vive family, there will almost certainly be marked differences from the HTC Vive currently on the market. This is, obviously, largely due to the fact the standalone headset needs to have its power source and connectivity self-contained. There's still a lot of mystery surrounding HTC's first mobile VR headset, but developers who are interested in creating content for the device can register here. It would make sense for HTC to time the standalone Viveport headset's release around the launch of its Daydream-powered counterpart, though again HTC is keeping that information under wraps at the moment. 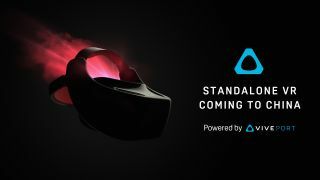 As for price, this Vive standalone headset will be "more affordable" yet still offer a high-quality experience, according to an HTC and Qualcomm press release. Despite the lack of details, HTC is clearly ready to push ahead with standalone VR, fleshing out its Vive lineup with more affordable mobile products. Marc Metis, Global Head of Vive X at HTC Vive, recently told TechRadar that HTC is developing new Vive products at different price points, and is "working with new partners to address new segments." We don't have confirmation Metis was referring to Qualcomm and the Vive Standalone VR headset with his remarks, but it's likely the new device was top of mind. With a take-anywhere headset announced for China, we probably don't have long to wait until the Daydream-powered HTC Vive makes its debut in other markets.